Here is the list of 12 of the tools I use in my business on a daily basis. #1- To collect payments and create new products. I use SamCart for my shopping cart and it lets me automatically deliver my digital files, create upsell products, sell physical products, and so much more. It's $99/month and worth every cent for me because it keeps the stats, tracks views, and conversions so I know if a product is converting well and when does it need to be tweaked. If you're looking for a lower cost option to deliver digital products, check out SendOwn (it offers an upsell option. ), PulleyApp, or DPDcart. I use Loom to record my screens for my video trainings, video audits, walkthroughs and more. It’s a free app, and they also have a paid version now. The site is Useloom.com. This records both screen and audio as well as storing your videos so they can be shared or downloaded. I also use Screencast-o-matic for quick and simple video edits. #3- To create a website. Squarespace is currently my favorite site to create websites. You can easily buy new domains, they have amazing drag and drop templates so you don't have to be a coding wiz, and they are self hosted, so no outside hosting required. They also have AMAZING customer support so if you need help with anything, they have you covered. I use the Pacific and Five templates. I use my site for my Instagram links page, registration page, opt-in page, as well as my sales pages. Everything can be done on the same platform which makes keeping everything organized so much simpler. #4- To schedule my Instagram content. I don’t schedule my content often but if I need to Planoly is my go to site. Their site allows you to schedule videos, multiple photo posts, Instagram Stories and more. You can also answer comments directly on the website which is a great way to boost your engagement without having to be tied to your phone. Deadline Funnel is awesome for creating countdowns and you can add the codes just about every where from Samcart to your mailing list. It helps to boost sales when people know they have a limited time to buy items. Motion Mail is a great free option if you want to add simple timers to your emails. I teach a class at least once a week whether it’s a free one used to grow my email list or one of my paid Masterclasses and I use Canva to create all of my slides. They’ve added a ton of templates to Canva For Work so there are endless options for styling your slides for your brand and the most impact. Canva also has a new Present and Website mode that you can use along with Loom to make prerecorded videos. WebinarJam is the my current platform and I love them because of the class size that I need for my webinars. It's $397 a YEAR, which is perfect for me as my audience grows I need the ability to have unlimited classes without needed a ton of software or paying $500/MONTH which is what I would have needed for most of the platforms I checked and it would have only given me a room for 1000 people. Webinar Jam makes replays a breeze as well so you can use them to continue to build your lists and sales funnels. You can also use Youtube Live as a standalone to host your webinars for free and just create a page on your Squarespace website. For smaller class sizes(under 100) , Zoom is a great starter platform. From setting up email sequences, sending out my regular broadcast emails, connecting to my audience, CK has a ton of features that will help you create a strong and profitable email list. They’ve also updated many of their forms recently so you have many options built directly into the platform. I use txt180.com for my text message marketing. You can send text messages for reminders when you’re going Live, about sales, free content to build your list, challenges and so much more. I’ve fallen in love with text message marketing because it gives your audience another way to connect directly with you and the response rate is amazing. #11- To create courses and membership sites. I moved back to Kajabi last year and now that I've learned how to work the platform, I'm kicking myself for not committing to it earlier. Kajabi hosts all of my Masterclasses, my courses, and will host my new membership site. It integrates with Samcart which is always a plus and makes my life easier. Alright, those are the systems I use daily so if I missed anything let me know in the comments. 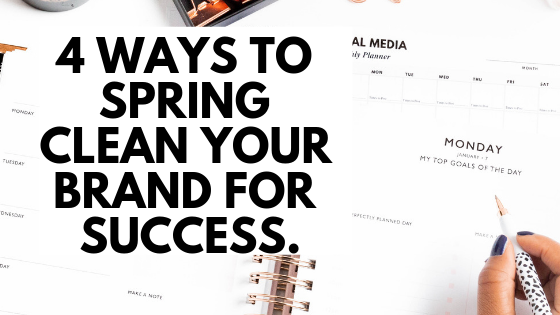 With a new month, you may be seeking ways to scale up your business, try out new tools, or swap some old ones out. Here is the list of 8 of the tools I use in my business on a daily basis. Beginning a business can come with what seems to be an overwhelming to do list. Some may want to skip corners and just complete the bare minimum, which in my opinion just makes more work in the long run. I have narrowed down what I consider to be 4 essential plans to have in place when your goal is for your small business to succeed. What are the what, whens, hows, and whys of your business? Having this plan detailed and in place gives your brand/business direction, as well as focus. Need a business plan template? What is your brand identity?What is your brand voice? What need does your brand fill? How do you want to be viewed by potential clients or other businesses? You have great products, but how do you get them to your ideal client, better even who is your ideal client? What is your market niche? What ways do you advertise to be the most effective? This plan will help you ensure that your product is being seen by the ones who need and will buy it. Putting it altogether, how will you be profitable? What are your profit goals and how will you achieve them? Do you need help creating one of the above plans for your business? Contact Me.